India’s latest federal budget hiked customs duty on a range of popular imports. The list of imports affected include mobile phones, toys, watches, footwear, imitation jewelry, as well as certain precious stones, auto parts, and cosmetic items. The details of the amended Basic Custom Duty (BCD) rates of some key imports are listed in the table below, while full list of the revised rates can be accessed here. The hike in import duties is a last mile effort by the Modi government to incentivize domestic manufacturing in India and encourage businesses to source components locally. They seek to discourage imports from China and other Asian countries, and promote domestic value addition in its stead. This outcome may, however, take longer to realize as domestic players will need a host of conditions to materialize before becoming competitive suppliers. Stakeholders worry that raising the duty rates could dent consumption in urban markets and drive inflation. Further, they contradict Prime Minister Modi’s remarks at the World Economic Forum (WEF) meeting in Davos, Switzerland – where he pledged to stand against trade protectionism. On the other hand, local manufacturers in the automobile components industry are ecstatic – items such as engine, transmission parts, brakes, suspension, gear boxes, and airbags, among others, account for more than 50 percent of the US$43.5 billion domestic industry’s turnover and over 30 percent of its US$11 billion exports. The budget has also hiked cess duties. The Education Cess and Secondary and Higher Education Cess on imported goods will be abolished and replaced by the Social Welfare Surcharge. This surcharge will be levied at the rate of 10 percent of the aggregate duties of customs, on imported goods. This is to provide revenue for the government’s expanded social welfare spending. Goods that were previously exempt from the Education Cesses on imports, will, continue to be exempt from the new Surcharge. 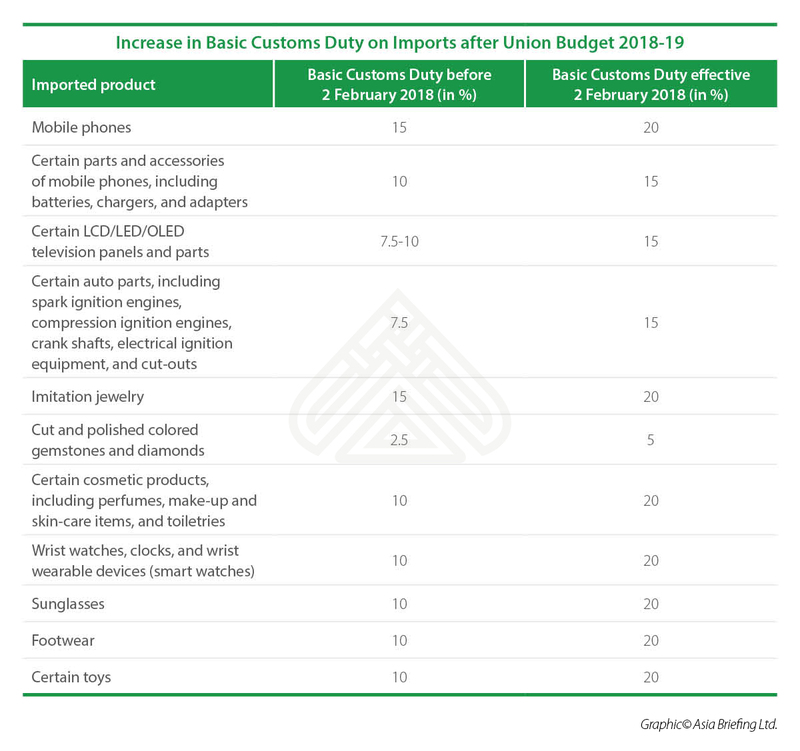 Finally, certain specified goods – as mentioned in the Annexure 6 to the Union Budget speech – will attract the proposed Surcharge at the rate of 3 percent of the aggregate duties of customs. Silver, gold, petrol, and high speed diesel oil are among the affected goods. India Briefing is published by Asia Briefing, a subsidiary of Dezan Shira & Associates. We produce material for foreign investors throughout Eurasia, including ASEAN, China, Indonesia, Russia, the Silk Road, & Vietnam. For editorial matters please contact us here and for a complimentary subscription to our products, please click here. Dezan Shira & Associates provide business intelligence, due diligence, legal, tax and advisory services throughout India and the Asian region. We maintain offices in Delhi and Mumbai and throughout China, South-East Asia, India, and Russia. For assistance with India investment issues or into Asia overall, please contact us at india@dezshira.com or visit us at www.dezshira.com.